Over at Spencer Carter’s Microburin blog a recent post has discussed the possible evidence for the Mesolithic Storegga tsunami in the Tees bay in north eastern England. Although normally concerned with Mesolithic flints Spencer has crafted a wonderfully detailed and engaging post on the archaeological and palaeo-environmental evidence for marine regressions and transgressions in the bay, helping to highlight the rich (and perhaps I’d say overlooked) archaeological record for the north east of England. In particular this post highlights the value of researching monographs from local archaeological units, and of new vital research into the character of the Mesolithic period in northern England. The challenging and changing nature of the Tees bay in evaluating the palaeo-environmental changes highlights the necessity to cast a critical eye over the available literature and on-going research projects. In particular highlighting the effects of long term international events (recline of the last great ice sheets and post-glacial recolonisation) with the regional and national differences in the organisation of societal organisation during the Mesolithic, Neolithic and preceding Bronze ages. Spencer’s post really integrates the relationship between the physical geography and the impact on the human use of the landscape and of societal organisation: this is a rich area of investigation. The Storegga slide events, an massive slide of landmass of the Norwegian coastal shelf around 6100 BC, would have had an phenomenal effect of the communities and landscapes affected, and although the palaeo-environmental evidence at Hartlepool and the Tees bay finds no direct evidence for it (as of yet), there are indications of similar ‘surges’ of sea level in similar horizons (Waughman 2005). This is a fruitful topic, perhaps one of the most interesting in Mesolithic studies, and Spencer’s post helps to put it in context. Meanwhile I was recently in Sheffield to catch a guest lecture by Los Angeles based art historian and photographer Paul Koudounaris at the University’s Archaeology department. Detailing the findings of his recently released book, ‘Heavenly Bodies’, Koudounaris expertly detailed the majestic bejeweled saints that can be found throughout Central Europe in a captivating and enlightening lecture. The book itself details the wonderfully decorated ‘saints’ (decorated skeletons) in more detail with a lively and informative text accompanying the highly textured photography, truly bringing the so called ‘saints’ back into the limelight. 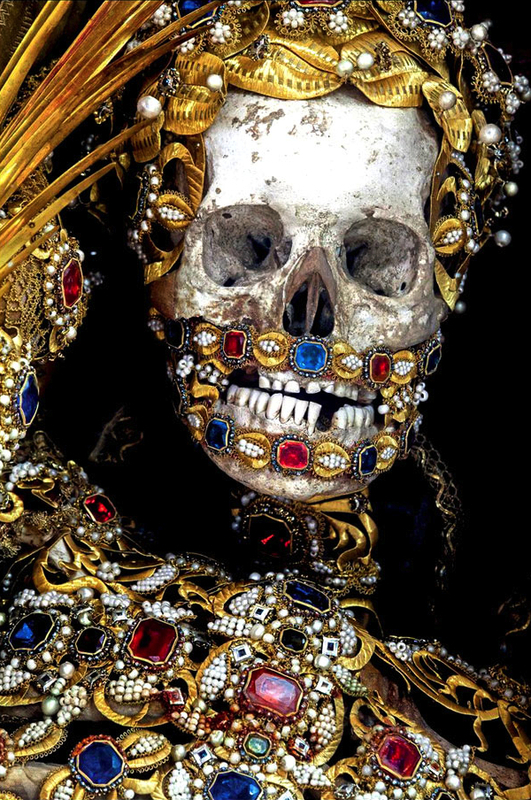 The bejeweled skeleton of St Valerius in Weyarn, Germany. Note the careful attention to detail of the wire gold hair, jeweled mandible, eyes and nose, and extravagant torso decorations. 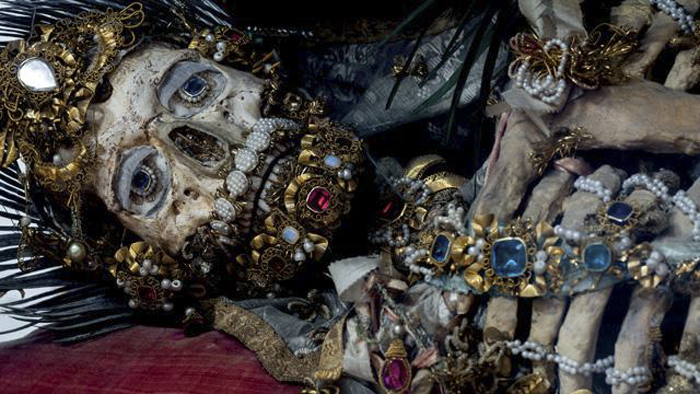 The ‘saints’ were often skeletons picked seemingly at random from the catacombs and given a saints name, although there are many miracles attributed to the skeletons once they were placed in-situ in their church (Source, photograph by Paul Koudounaris). Various Imperial Roman catacomb burials of Christians (such as Coemeterium Jordanorum & Coemeterium Priscillae) were rediscovered accidentally during the 15th and 16th centuries in and near Rome, at a time of revolt in the Christian world as the Protestant Reformation helped to split the Catholic church in Europe. The Catholic church, sensing a possible use of the newly discovered skeletons, used the remains as examples of early Christian martyrs despite next to no evidence and only vague documentary evidence in the catacombs themselves. Having agreed that certain skeletons represented Christians martyred during the Roman period, the church shipped many of the articulated and non-articulated remains to German speaking lands (such as Germany, Austria, Poland and Switzerland, as they represented the heart of the Reformation movement) and had the remains re-enforced with gauze, decorated with jewels and silk and displayed them in prominent positions in churches throughout Central Europe as a method of inspiring and supporting the counter reformation movement (Koudounaris 2013: 32). Following centuries of displaying the holy relics, many of the ostentatiously decorated individuals were removed from show during the 19th and 20th centuries as they became viewed as being outdated and embarrassing motifs for the Catholic church. The remains of St Albertus, arrived in Burgrain, Germany, in 1723. Note the particularly fine decoration of the golden hair and heavily jeweled torso, which indicate the wealth of heaven awaiting the faithful. Often the skeletons were re-enforced with gauze, silk and sometimes cardboard inside to support the torso. St Albertus clearly has a mandible which probably does not belong to the above crania, note the uneven dental wear (Source, photograph by Paul Koudounaris). Frankly the saints that Koudounaris has managed to find in the predominantly German speaking countries of Central Europe are first and foremost works of art of a very high standard, many crafted with care and dedication over months and years by small teams of nuns and church members. Although many are now lost to history, either destroyed, lost or hidden completely, a small platoon still survive and still on view in many churches across Central Europe (Koudounaris 2013: 174). If you ever happen to be around Sheffield, the University archaeology department often run Tuesday dinnertime guest lectures which are sometimes (I believe mostly) open to department members and the public alike, it is well worth a look in! Paul Koudounaris is also currently taking in a number of guest lectures with upcoming talks based in north America, further information can be found here. Carter, S. 2013. Storegga Mesolithic Tsunami: Is There Evidence in the Tees Area? Microburin Blog. 24th August 2013. Waughman, M. (Ed.) 2005. Archaeology and Environment of Submerged Landscapes in Hartlepool Bay, England. Tees Archaeology Monograph. Vol 1.